Take your pick of a half-dozen FWA chapter meetings this month, plus many more for writers of all persuasions. First Coast Christian Writers meets each Thursday at 6:45 p.m. in room 513 of Christ's Church at 6035 Greenland Road. Affiliated with FWA, FCCW is open to all writers. Contact Tracy Redman at tlsl72@yahoo.com. Here's a twist on the same topic: Nadine Vaughn, author of Native Land, Lost in the Mystery of Time, will present "How to Turn a Screenplay into a Novel" at the Amelia Island Writers meeting, Tuesday, March 16 at 6:00 p.m. at Books Plus, 107 Centre Street in Fernandina Beach. Contact chapter leader Maggie deVries, maggie1948@yahoo,com. Clay County Writers keeps growing. This month's meeting, on Wednesday, March 17 at 6:30 p.m. at the Fleming Island Public Library, will feature children's mystery writer, June Weltman presenting, "Dreaming About Writing a Kids' Mystery? Follow the Clues?" June will provide plenty of clues, including trends in today's kids' mysteries and writing tips for creating memorable characters. Contact Maureen Jung at mjung@wordspringconsulting.com. Head to St. Augustine's Main Library on Saturday, March 20 at 10:15 a.m. for a joint program of both the Ancient City Writers and the Ponte Vedra Writers. Vic DiGenti, yep, that's me, presents, "Put Your Writing into High Gear with Strong Narrative Drive." Find out what narrative drive is and why editors and agents prize it so highly. Vic will use examples from classic novels like To Kill A Mockingbird, Silence of the Lambs, Mystic River, and even the TV series, Lost, to demonstrate highly-effective techniques for creating strong narrative drive. As mentioned above, the Ponte Vedra Writers chapter will be meeting jointly with the Ancient City Writers this month, but mark your calendar for Saturday, April 24 for a very special program at the PV Library. The subject is, "The Many Roads to Getting Published," and we'll present a panel with a traditonally-published author, an independent publisher and author, a self-published author, and a new traditional publisher. More details next month. Florida Sisters in Crime meets this Saturday, March 6 at 10:30 a.m. at the SE Regional Library. Guest speaker is State Attorney Angela Corey. North Florida Writers meets on the second Saturday of the month at 2:00 p.m. at the Webb-Westconnett Regional Library at 103rd Street near I-295. Also meeting on the second Saturday of each month is First Coast Romance Writers. They meet at 10:30 a.m. at the West Regional Library on Chaffee Road. Society of Children's Book Writers & Illustrators meets on the third Saturday of the month at 1:00 p.m. at the SE Regional Library. The Bard Society meets each Wednesday at 7:00 p.m. in the home of leader/mentor, Frank Green. This is the longest-running critique group in the region, producing numerous published authors. Call Frank at 234-8383. You may now submit your entries for this year's Royal Palm Literary Awards. Click on the link for submission guidelines. Last year, more than a dozen NE Florida writers won awards. This could be your year. While you're on the FWA website, check out the guidelines for FWA Collections #2 – Slices of Life. Submissions are now being accepted. Remember you have to be an FWA member to enter the competition, submit to the anthology, and attend the October conference. So, while you're there, go ahead and join. You'll be glad you did. Details of the 9th Annual FWA Conference, Go for the Gold!, will be forthcoming soon. But you don't have to wait until October if you need a conference fix. The 4th Annual Do It Write conference in New Port Richey is scheduled for Sunday, April 11. It's a one-day affair with a great line-up of speakers. Register before March 20 for an early-bird discount. The Lorian Hemingway Short Story Contest is underway. Winner receives $1,000 and publication in the Saturday Evening Post. They're looking for original, unpublished fiction no longer than 3,000 words. The Tallahassee Writers Association presents the Tallahassee Festival of Books & Writers Conference, March 19-21. Florida Institue of Technology's Creative Writing Institute is set for June 6 - 13. Closer to home, the 2nd Annual UNF Writers Conference with a full day of workshops and a day and a half of critique workshops is ready for your registration. Co-sponsored by FWA, the conference offers the workshops, the Book & Film Deal Connection, two lunches, a reception and the First Page Panel. The Florida Heritage Book Festival will honor bestselling author Carl Hiaasen at their Literary Legend Award's banquet at the World Golf Village Renaissance Center on Friday, September 24. And speaking of the FHBF, their "Five Women of the Ages" is back by popular demand, Sunday, March 28 at 3:00 p.m. at the Casa Monica Hotel. Cl ick on Events for details. Finally, First Coast News anchor Donna Deegan is also a published author. 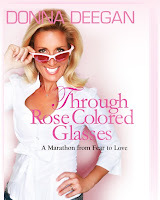 Her latest book, Through Rose Colored Glasses, chronicles her battles as a three-time breast cancer survivor. She's the guest author at Book Talk Cafe, a program of the Friends of the Ponte Vedra Library, and will appear at the library on Monday, March 15 at 6:30 p.m. Donna is also the founder of 26.2 with Donna, the highly-successful marathon that drew nearly 8,000 runners recently in support of breast cancer research. And I'll end with a quote from a guy who knew how to string words together, Sir Winston Churchill. "Short words are best, and the old words, when short, are best of all."